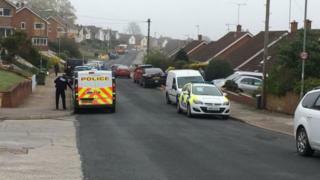 A woman has been found dead at a house in Exeter. Officers were called to Chancellors Way at about 04:30 BST following reports of concerns for the welfare of a woman. The 35-year-old was pronounced dead at the scene. A 35-year-old man was later arrested on suspicion of murder. The man was arrested at a branch of Spar in Pinhoe, about than a mile away, and is in police custody in Torquay. Both premises have been cordoned off. Devon and Cornwall Police said officers were not looking for anyone else in connection with the death.